Details on the upcoming Resident Evil: Revelations have revealed that Jill Valentine and Chris Redfield are taking a cruise on Umbrella's dime. The latest issue of Famitsu not only contained new information about the Nintendo 3DS's Resident Evil: The Mercenaries 3D, but also revealed the basic plotline for the 3D handheld's Resident Evil: Revelations, the next Resident Evil game that will actually have a story. Revelations puts the dream team of Jill Valentine and Chris Redfield back together again as they continue the battle against the Umbrella Corporation's sinister machinations on a cruise ship. This cruise ship is anything but luxurious, because if there's anything that ruins a buffet it's monsters that hog all the bacon. The game takes place between Resident Evil 4 and Resident Evil 5 just after the formation of the Bioterrorism Security Assessment Alliance (BSAA), of which Jill and Chris are members. The organization's goal is to track down bio-organic weapons typically deployed by Umbrella, which brings the duo to the cruise ship somewhere in a European body of water. The story of Revelations hasn't been expanded on much past this basic information, but Capcom did say that it wants Revelations to stand on its own for new players. Still, there will be a connection to previous or future titles. Concept art also reveals possible locations other than the cruise ship, including a snowy area with a crashed plane, and a ruined port town. 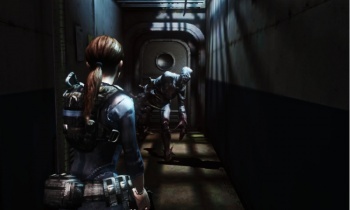 The idea behind the design of Revelations is to bring back the feel of the series circa Resident Evil 3 and earlier, which was more about "exploration and puzzle solving." The action might be slower than Resident Evil 4 and 5, but it'll recreate the feeling of horror that was once experienced when zombie dogs would jump through windows, or giant monsters would smash through walls. Players can evidently move while their gun is equipped, but there doesn't appear to be any mention of the ability to run while shooting like with Mercenaries 3D. Capcom wants to create a new form of control for Revelations, Famitsu reports, but unfortunately what this means is unclear. Resident Evil: Revelations is said to be only 20% complete, so it might not be released for quite some time. The 3DS itself will be released in Japan on February 26, 2011, so Revelations isn't looking like a launch title right now.